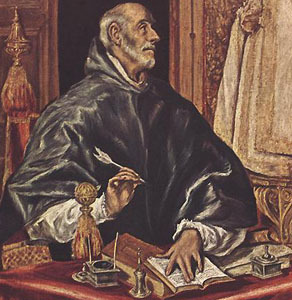 Archbishop of Toledo; died 23 January, 667. He was born of a distinguished family and was a nephew of St. Eugenius, his predecessor in the See of Toledo. At an early age, despite the determined opposition of his father, he embraced the monastic life in the monastery of Agli, near Toledo. While he was still a simple monk, he founded and endowed a monastery of nuns in Deibiensi villula. We learn from his writings that he was ordained a deacon (about 630) by Helladius, who had been his abbot and was afterwards elected Archbishop of Toledo. Ildephonsus himself became Abbot of Agli, and in this capacity was one of the signatories, in 653 and 655, at the Eighth and Ninth Councils of Toledo. Called by King Reccesvinth, towards the end of 657, to fill the archiepiscopal throne, he governed the Church of Toledo for a little more than nine years and was buried in the Basilica of Saint Leocadia. To these scanty but authentic details of his life (they are attested by Ildephonsus himself, or by his immediate successor, Archbishop Julianus, in a short biographical notice which he added to the "De viris illustribus" of Ildephonsus) some doubtful or even legendary anecdotes were added later. At the end of the eighth century Cixila, Archbishop of Toledo, embellished the biography of his predecessor. He relates that Ildephonsus was the disciple of Isidore of Seville, and recalls in particular two marvellous stories, of which the second, a favourite theme of hagiographers, poets, and artists, has been for ages entwined with the memory of the saint. Ildephonsus, it is said, was one day praying before the relics of Saint Leocadia, when the martyr arose from her tomb and thanked the saint for the devotion he showed towards the Mother of God. It was related, further, that on another occasion the Blessed Virgin appeared to him in person and presented him with a priestly vestment, to reward him for his zeal in honouring her. The literary work of Ildephonsus is better known than the details of his life, and merits for him a distinguished place in the roll of Spanish writers. His successor, Julianus of Toledo, in the notice already referred to, informs us that the saint himself divided his works into four parts. The first and principal division contained six treatises, of which two only have been preserved: "De virginitate perpetuâ sanctae Mariae adversus tres infideles" (these three unbelievers are Jovinianus, Helvidius, and "a Jew"), a bombastic work which displays however a spirit of ardent piety, and assures Ildephonsus a place of honour among the devoted servants of the Blessed Virgin; also a treatise in two books: (1) "Annotationes de cognitione baptismi", and (2) "Liber de itinere deserti, quo itur post baptismum". Recent researches have proved that the first book is only a new edition of a very important treatise compiled, at the latest, in the sixth century, Ildephonsus having contributed to it only a few additions (Helfferich, "Der westgothische Arianismus", 1860, 41-49). The second part of his works contained the saint's correspondence; of this portion, there are still preserved two letters of Quiricus, Bishop of Barcelona, with the replies of Ildephonsus. The third part comprised masses, hymns, and sermons; and the fourth, opuscula in prose and verse, especially epitaphs. The editions of the complete works of Ildephonsus contain a certain number of writings, several of which may be placed in either of the last two divisions; but some of them are of doubtful authenticity, while the remainder are certainly the work of another author. Moreover, Julianus states that Ildephonsus began a good number of other works, but his many cares would not permit of his finishing them. On the other hand, he makes no mention of a little work which is certainly authentic, the "De viris illustribus". It may be considered as a supplement to the "De viris illustribus" of Isidore of Seville, and is not so much a literary historical work as a writing intended to glorify the Church of Toledo and defend the rights of the metropolitan see.